Claire Harte-Mathias is an infinitely capable solver of other people’s problems. Along with her husband, she has established a prestigious foundation to aid in the rehabilitation of people with spinal cord injuries. Training therapists, counseling patients, and conducting workshops keeps Claire busy, fulfilled, and happy. It is a life she wouldn’t trade for anything…and one that is about to fall apart. One snowy night, Claire tries and fails to prevent a tragedy from occurring. The incident at first obsesses her, then seems to trigger something deep in her soul. Soon she is haunted by momentary disturbing visions – terrifying images that are vaguely familiar, yet unexplainable. Slowly Claire comes to realize that the pictures are in fact fragmented and forgotten memories of her childhood – a childhood she has always remembered as close to perfect. While part of her wants to see where these memories will lead her another part wants only to run from them, to bury them once again. Confused and frightened, Claire is caught up in a complex and devastating struggle between yesterday and today; between the man who wants to help her and the husband who cannot; between terrible secrets and life-altering revelations. In her fight to uncover and accept the truth, Claire discovers that the past, present, and future are intertwined in a way she can never change…or forget. Written with sensitivity, Brass Ring is a heartfelt and mesmerizing novel of great loss and even greater courage. As I may have mentioned, Diane Chamberlain is one of my favorite authors. I’ve been trying to remember which books I read first. I’m pretty sure it was this one. At any rate, “Brass Ring” is the one that sticks out most in my mind almost twenty years later. I can even picture where I was when I was reading it. I was waiting at the Driver’s licensing place, and I recall that I was trying not to cry at a particularly emotional part. This novel has stayed with me all this time. It was a heartbreaking, intense read that deals with some heavy subject matter. Although it was difficult to read and upsetting at times, I’ve always felt that Diane Chamberlain handles these issues with sensitivity and respect. I’ve wondered if I would feel the same about it all these years later. Would I love it as much as I did back then? From what I remember, “Brass Ring” was a well-written novel that kept me guessing right up until the very end. I’m definitely going to take some time to read this one again as soon as possible. I’d love to hear if you’re a fan of Diane Chamberlain. And if you are… what is your favorite novel that she has written? I loved Necessary Lies too! Fantastic book. I think that Pretending to Dance is the only one I haven’t read yet. I definitely need to read it soon. I’m also looking forward to her novel coming out in October! I’ve never read any books by Diane Chamberlain, but I’ve heard good things about her. I actually have an audiobook called The Silent Sister. Heard of it? I read that one a few years ago and from what I remember, I really enjoyed it. I hope you like it! She is hit or miss for me, but this one sounds good. Thanks for posting, I will put it on my TBR list. I hope you enjoy it if you do end up reading it! Happy reading! 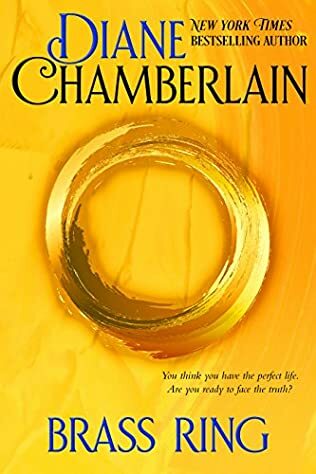 I haven’t read this one, but I do love Diane Chamberlain! I need to add it to my TBR! Necessary Lies and The Stolen Marriage have been my favorites, I think! I really enjoyed both of those as well. I think you might like this one. I hope you enjoy it if you do decide to read it. Happy reading!